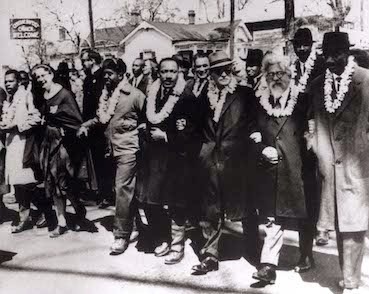 Notes from a Jewish Thoreau: No Rabbi Heschel in "Selma" movie? Inexcusable! I was looking forward to seeing the new movie, Selma. 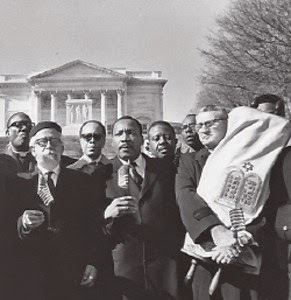 Emblazoned in my heart is the iconic photo of Dr. Martin Luther King marching with Rabbi Abraham Joshua Heschel in the front row. A photo that for my generation has come to symbolize the unity between Jews and African Americans during the 1960s. For years I have told friends, family, and students to "watch for the man with the bushy white hair and beard" in the original Selma footage. Unfortunately, in the new movie Rabbi Heschel does not appear in this scene or anywhere else! The omission has me -- along with a lot of the Jewish community -- wondering why not. The appearance of Heschel (second from the right) in that famous photo was not tokenism. Rabbis and lay Jews alike were involved in the lunch-counter sit-ins, the Freedom Rides. the early protests. Andrew Goodman and Michael Schwerner -- both martyred on the same night as James Cheyney -- were both Jewish. And while it is true that Southern rabbis tended to lay low publicly, for fear of antisemitism and violence against their congregations (some synagogues were actually fire bombed) many helped behind the scenes. And that doesn't count unknown Jewish laypersons. But most visible of all was Rabbi Heschel, right up there in the front row, only one person away from Dr. King. Messing with this image is, to me, a sort of historical sacrilege, like changing the profile of the flag raising on Iwo Jima or the 13 stars on Betsy Ross's flag. Some things are not meant to be changed. I'm not asking that Jews be given equal time. All it would have taken was to have an actor made up like Heschel for this scene. Would that have been so hard? King and Heschel had met at a conference on "Religion and Race" at the National Conference of Christians and Jews in 1963, where Heschel gave the opening speech and King gave the keynote address. After the first Selma March, known as "Bloody Sunday" (March 7, 1965), Heschel led a delegation of 800 people to FBI headquarters in New York City, protesting the lack of protection for the marchers. King invited him to come to Selma for the next march and he did. "For many of us the march from Selma to Montgomery was about protest and prayer. Legs are not lips and walking is not kneeling. And yet our legs uttered songs. Even without words, our march was worship. I felt my legs were praying." Heschel and King remained close friends and continued to work together. When King won the Jewish Peace Award, it was Heschel who presented it. In fact, King was looking forward to attending a Passover Seder at Heschel's home, but was assassinated before that could happen. Rabbi Heschel was the only rabbi to speak at King's funeral. look like Heschel, even though he is in the same place. 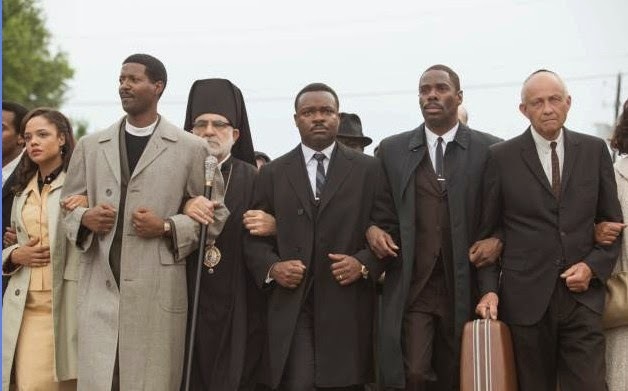 So, with all these iconic images and events, why don't we see Rabbi Heschel -- or any other rabbi -- in the movie, when we do see King embrace a Greek Orthodox priest, and can recognize a Roman Catholic priest, a Protestant minister, and other clergy in the front row? One reviewer does make mention of "an elderly Jew in a yarmulke" -- and there is such a gentleman standing in the place occupied by Heschel in the original photo. But Heschel usually wore a beret -- not a yarmulke. And this stand-in, if indeed he is supposed to be Heschel, lacks the bushy hair and beard of the real Heschel. So much so, that Jewish reviewers do not see him as such. Neither do I. "In the movie the protesters aren't wearing flower leis. I don't point this out to quibble with the director's costume choice but rather to draw attention to the curious absence of the spiritual sentiment that held these marchers together. They firmly believed that only a religious faith capable of transcending clannish religious divisions could challenge the deep injustices of American society. This confidence in a divine love that made the overcoming of such religious parochialism possible swelled in the hearts of the marchers and anchored the close friendship between King and Heschel. The activists truly felt that the many faces of God had their eyes on Selma." Maybe the leis are gone for costuming reasons, out of concern that modern viewers might find them strange or puzzling. Then again, that could have been solved by showing the Hawaiian representative giving them and explaining the significance. Or maybe -- sadly -- the spiritual-political unity my generation felt back in the 1960s is gone. Maybe the film unconsciously (?) ended up reflecting that. In recent years there has been a lot of tension between the black and Jewish communities, something that makes me very sad. I had hoped this movie might bring back the story of how Jews and African Americans had once worked together for freedom. But with Jews omitted from the script, that message is lost. Whatever the reason for omitting Heschel and the Hawaiian peace symbols, their absence has made me decide not to rush out to the theater to see this movie. And that, too, makes me sad. Timeline of the "Selma" controversy on Hitfix -- covering not only the Jewish issues but everything else people are debating about this film. Excellent chronological roundup summaries with links to major articles. Following in My Father's Footsteps - Suzannah Heschel. Interesting personal memories. 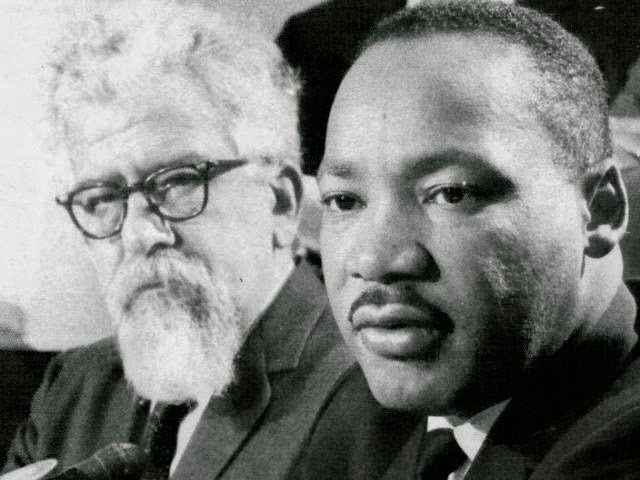 Another Failure of the Selma movie: Why Did It Leave Out Rabbi Abraham Joshua Heschel? -- Jeff Dunetz in The Lid. Has nice photos, including a telegram Heschel sent to King in the Birmingham jail. Jewish Voices from the Selma Montgomery March -- some interesting firsthand stories -- including a Sabbath service -- about Jewish participation at Selma, from the Duke University Library, which houses the collection of Heschel's papers. When we marched together in Selma - S.L. Wisenberg in The Forward. Some Selma history plus a look toward hope for the future. Praying with my Legs -- a two-hour upcoming documentary on the life and teachings of Rabbi Heschel. A worthwhile project -- and definitely needed, as all of this controversy over Selma will attest. Visit the site and consider donating to the project. I am willing to bet this is one reason Selma got "snubbed" at the Oscars. Being about MLK does not automatically get Best Picture. Accuracy counts. DuVernay snubbed Heschel's legacy & her karma came back.. Personally, I'm of the opinion, and my father actually agrees with me on this, is that DuVernay, like most African Americans, is bitterly resentful of the fact that most Jewish Americans are relatively comfortably wealthy and live in nice houses and other homes, whereas most African Americans, on the other hand, are actually relatively poor and thus live in the ghettos and the projects and are largely subsisting on welfare. In DuVernay's mind, she will only be happy if the black community is in the majority and the white community is in the minority. Could be. I think the Jewish value placed on education has a lot to do with it too. There is now a tendency to disparage mainstream edu as "white man"stuff. Which ends up hurting their own youth. Didn't used to be that way. Older people tell me they valued edu because they knew it was the way to success. Good day! Your article is excellent. I wanted to point out that I think the picture you have with the gentlemen holding the Torah at the "Alabama State Capitol Building" is actually at the Arlington National Cemetery. That march was against the Vietnam War in Washington in February of 1968. The only reason I wanted to comment was I am researching whether or not a Torah ALSO marched during Selma in 1965 and was wondering where your resource for that particular picture was. If you get a chance, could you please let me know of your resources? There's a LOT of erroneous information concerning this matter online, and I'm trying to find out the truth! Thanks again, so much. And again- great article! You are correct. The photo is in Montgomery, not Selma. Will fix that. But Rabbi Eisendrath apparently did carry a Torah from Selma to Montgomery. This article www.chicagotribune.com/news/ct-torah-marches-from-selma-met-20150731-story.html" makes ref to it by a Rabbi Limmer in Chicago, who was inspired by the same photo and refs to it as "at the end of Selma." Unless the Torah didn't make the whole journey but was brought there afterward. I suppose you could ask Rabbi Limmer if he knows.